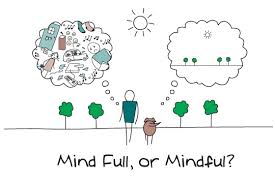 Mindfulness involves learning to direct our attention to our experience as it unfolds, moment by moment, with open-minded curiosity and open-hearted acceptance. Rather than worrying about what has happened or might happen, it trains us to consciously respond more skilfully to whatever is happening just now, whether it be good or bad…. it helps us become more aware of our thoughts and feelings so that instead of being overwhelmed by them, we’re better able to manage them.